Hi! Quick question about storing water. I fill gallon jugs, one with fresh, one with MSW. I also store some Dechlorinated FW and MSW in Tupperware dishes for randoms like rinsing items etc. how long will each last before becoming unable to use...if it does? I'd like to know the answer to this too! I had read on here something about the ammonia coming back. (unscientific description) I make my water in gallon jugs and it lasts a while. I got an ammonia tester and it registered 0. I'm sure others can explain better. I'll start off by saying that some people go weeks with it sitting out without issues. Anytime water is treated and left sitting out, bacteria and other things will start to grow. This can lead to slime in the bottle, or algae. The safest way is to store it in the fridge or just make it as you need it. If your water has high chloramines, then there may be readable ammonia leftover when using a dechlorinator. This ammonia usually still shows up on a test even if a dechlor that makes it safe for 24 hours has been used. It changes the ammonia to a safer form but doesn't get rid of it, so after 24 hours the safe ammonia reverts back into unsafe and has to be retreated. wodesorel wrote: I'll start off by saying that some people go weeks with it sitting out without issues. I have well water so not to sure how high any levels are. Ok, so if I decide to just make it as I need opposed to the gallon jugs, how much prime is added per cup? In the gallon jugs I was told 2 drops. Next question, if I were to continue with the jugs and refrigerate and my water DOES indeed have high Chloramines, will refrigerating it help prevent the ammonia build up post 24 hours? Sorry so many questions...just want to make sure I am doing this all right! Hermiesguardian wrote: I had read on here something about the ammonia coming back. (unscientific description) I make my water in gallon jugs and it lasts a while. I got an ammonia tester and it registered 0. I'm sure others can explain better. Where did you get the ammonia tester? Aquarium section I would think right? It works! A little alarmed to see calci-sand in that tank though. Is that an older photo? Calcium sand will not allow them to bury and molt safely!! Yes this was the old tank where 1/4 was the calci sand and the rest EE. I was able to get most of the calci sand dug out of there. 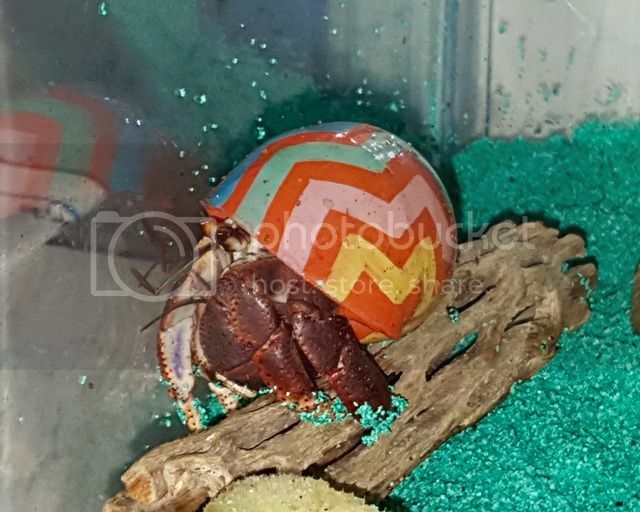 He/she has also changed shells since then. 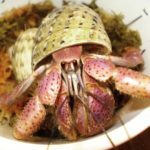 That particular crab would go to the other side of the tank to bury in the EE. Here's a small word of caution about refrigerated water. Allow the amount you are going to put in the water dishes to come to room temp before putting it in. Very early in my crabbing, I poured it directly into the bowl straight from the fridge. Well, Cher climbed into the pool almost immediately. I thought I'd stay and watch her have a bath.....and realized after about 30 seconds that she was completely immobile! I immediately realized what I had done, and grabbed her out of the water - he shell and body were so cold! I cupped her between my hands, and blew warm air at her. I had no idea if I was doing the right thing or not, or how to do Crabbie CPR! After what seemed like an hour but was probably only a few minutes, she started moving again, and I tucked her into a hidey right next to the heat mat. Thankfully she did fine, but I have been very careful with the water since! curlysister wrote: Here's a small word of caution about refrigerated water. Allow the amount you are going to put in the water dishes to come to room temp before putting it in. Very early in my crabbing, I poured it directly into the bowl straight from the fridge. Well, Cher climbed into the pool almost immediately. I thought I'd stay and watch her have a bath.....and realized after about 30 seconds that she was completely immobile! I immediately realized what I had done, and grabbed her out of the water - he shell and body were so cold! I cupped her between my hands, and blew warm air at her. I had no idea if I was doing the right thing or not, or how to do Crabbie CPR! After what seemed like an hour but was probably only a few minutes, she started moving again, and I tucked her into a hidey right next to the heat mat. Thankfully she did fine, but I have been very careful with the water since! Oh most definitely! When I refreshed the water last night prior to them being awake I removed the pools, cleaned, changed out the water and let them sit until they weren’t cold anymore.